Like many claims of this type, it can be debunked by one graph using routine health data. 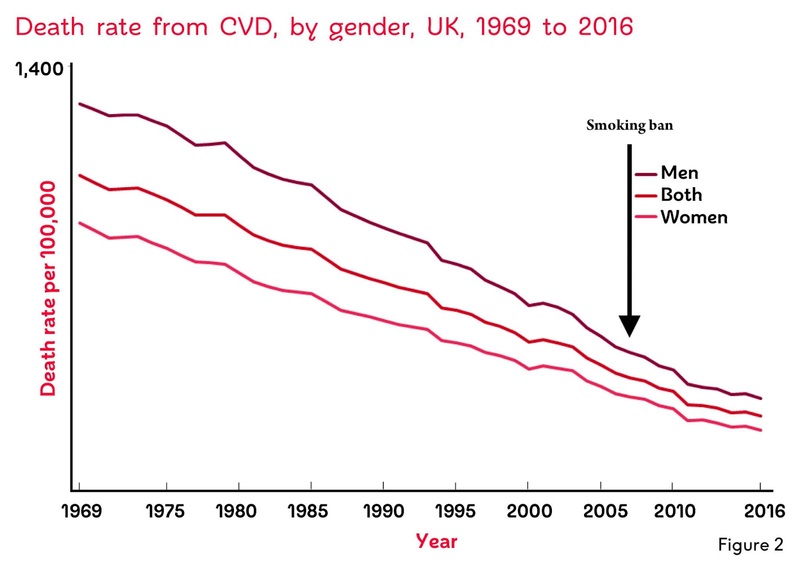 Note that there has not been a two-thirds reduction in 'heart deaths' since 2007, nor has the rate of decline accelerated. In fact, the rate of decline has slowed. So who is responsible for this ridiculous claim? Stan Glantz? Jill Pell? Anna Gimore? Alas, no. It's not a piece of junk science from tobacco control. It's a perfectly sensible study that has been horribly misreported by The Times. 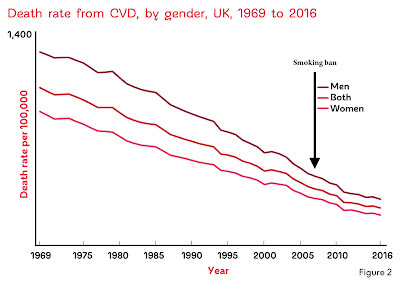 It looked at the cardiovascular disease death (CCD) rate in 21 countries and found that Britain has seen the second biggest decline since 1989. But even this is a much stronger claim than the authors of the study make. The word 'smoking' appears just three times, in two passages. In the first, smoking bans are considered as one possible factor among many. In the second, the decline in smoking is effectively dismissed as a reason for Britain having an unusually good record. It is appreciated that there may be many different clinical and social reasons for the reduction in CDD; for example - improved diagnostic monitoring and surgical procedures [3,4]; the use of lipid lowering therapy such as statins [5,6]; improved lifestyles [7,8]; reducing over-work [9,10]; cessation of smoking in public venues [11,12] invasive percutaneous intervention in patients presenting with acute coronary syndromes, as well as effective treatment of hypertension , diabetes and atherosclerosis [13,14]. There is a degree of debate whether public health approach, such as dietary changes, as opposed to treatment initiatives, have made the greater contribution [7,11,14]. .. What might have accounted for these general changes? Is this an indication of the effects of reduction of smoking ? Though the issue of increased obesity is a problem for future outcomes as obesity and CDD are linked [7,21,22]. It is feared that we may well see a reverse of these good CDD results in the coming years because of rises in obesity and type 2 diabetes in many Western countries [23,26]. Recent WHO data on insufficient physical exercise of younger people throughout the Western world, raises the question can the improvement be maintained [22,27]. One positive factor might be the International Tobacco Control efforts over past decades [11,23,28] but in a 15 country study, including the UK, Britain’s results were close to the overall average fall in smoking, as well as other public health approaches [10,11,22,23,26-30], so this does not seem primarily to be an explanation for the UK significantly improved outcomes. Well this is one in the eye for the serial deniers out there. It is nice to be able to say "we told you so" after their rants about the ban being a waste of time, the death of pubs (that being nothing to do with greedy pub chains and massively expensive beer), health and safety gone mad and the usual rubbish about the nanny state.